Miriam serenaded us on her birthday. 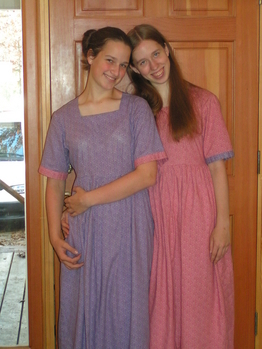 We wore our matching dresses, which I made for Miriam's 15th birthday. Was it really a whole year ago? 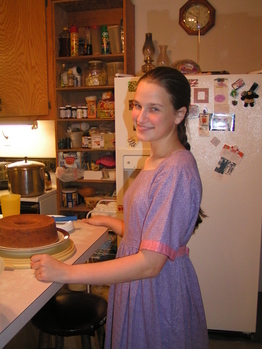 Care for some cake? Mrs. Lavonne made a delectable pound cake - Butterscotch Pecan. Yum! 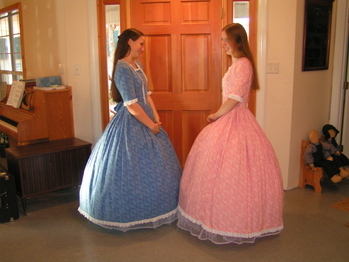 This morning we modeled our new hoops, wearing the pioneer dresses I'd made for Jubilee and I. Miriam wore mine, and I wore Jubi's, which was a bit shorter, but still fit well! Miriam looked lovely in the deep maroon color. 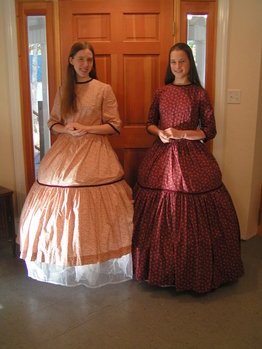 We felt a little like mushrooms or cakes, but hoopskirts are fun! I wish I had a hoop skirt!! They look like so much fun. I can also see that you had a great time together! Anna, can you tell that we were both trying not to laugh? After I looked at the picture, I remembered that we were holding in laughter for some reason. I think it was one of my brothers doing something. Ella, the hoop skirt is lots of fun. I was so surprised to get one. They make you feel like you're floating. Lovely! I am glad you all had a good time! 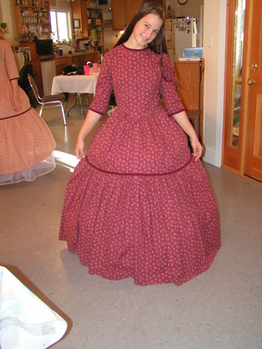 I remember Susan trying to make her own hoopskirt when we were younger. It didn't turn out very well! That would be very fun to have real hoopskirts, even though I doubt we'd have anywhere to wear them! That's funny, Hannah! =) I looked at patterns for hoopskirts before ordering them, but it looked like it would take too long and be too much of a pain to find all the wire and so on. I don't think we'll wear ours very much except for special dressy occasions, or just picture taking, but I figure that it's an investment, for one day we'll probably wear them with our wedding dress! Sorry, Blogger has not been letting us publish a comment that was made on this post. Bryant said, Oooooh, those dresses with the hoop-skirts are sooooo pretty! Where did you get them??? And what about the pattern for those dresses??? You both look so gorgeous and feminine!!!" Bryant, The pioneer dresses is a Butterick #3992. 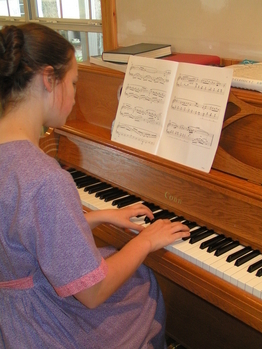 Anna made both of those dresses, but I'm hoping to make one in the future. 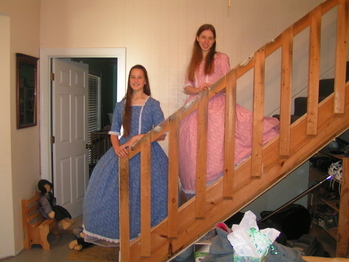 The colonial dresses are Simplicity #5041. I made the blue one and Anna made the pink one. 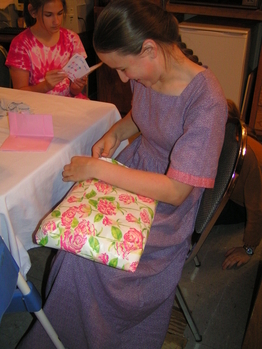 It was a sewing project we did together. You look so old and elegant! Hi! I stop by your blog quite frequently. I just wanted to let you know how much I enjoy reading your posts and how much inspiration I (as a 30 year old mother of 4) get from you two young ladies and your families. Last night as I was catching up on your blog posts, my 20 month old daughter was sitting with me. Every time I would scroll past one of the pictures of your hoop skirts, she would gasp. She was very impressed. We are a family of six: Welcome to our blog! I'm glad you enjoy reading the posts. Your little daugther sounds really cute. I guess girls in hoopskirts are a pretty rare site! =) Thanks for the link!